and using my birthday present...potting compost! and celebrating after the work! Cordial diluted 50ml to a glassful..and New Zealand Oyster Bay Merlot ...undiluted!! Elderflower and Rose cordial is easy..I based it on this recipe, halved, and instead of 50elderflower heads,used 40 plus the petals from eight Comte de Chambord roses. It should have a week's seeping before putting through a muslin/jeely bag..but after 24 hours its awesome already!! Out of interest, this is the uk distribution of the Magpie moth, found in North America as well as Europe...and there are others also called the same name due to their colouring. Pirate has started sorting the waterbutts..we have guttering for the workshop and sheds, but need fittings. I've been netting the beds..and planning the next one,for fruit. Today's incentive was the blackbirds stripping the yet to ripen redcurrants! The gooseberrys were ripe enough to use for cooking, so I cropped them, and found a fresh Magpie Moth. This was once a pest of goosberry and currant bushes.. I'm not sure if this caterpillar is related, but the colours are similar...I've now found that it is! This one was on the elderflowers..
and the elderflowers are now with petals from the Comte de Chambord rose, making,hopefully,cordial. This is the print that I've tried on Fabbriano Uno paper that is 50% cotton fibre. It is a cold press paper,as opposed to hot press..so a softer more textured surface. There are three roads leading towards Girvan, this Middle Road goes directly from Maybole to Girvan. Its a view I've seen many times on a cycle ride. I've been changing prices on Etsy, some up and some down, reviewing the whole range including things not on there already. I'm thinking of small prints, gift tags , notebooks... things easy enough to make and print. A3 prints ( about 30 cm x 40 cm ) do present a problem.Not in packing,as the post office sell a nice wee box which 4.8 x 4.8 x 31.5 cm...but the problem is how this will be classified by the post office. If its a "medium parcel" it will be over £4 to send, and to Australasia over £5....even though this package with an A3 print in is under 100gm. This calls for a visit to our best local post office in Prestwick. Stand-alone post offices are few and far between here, and are worth supporting. Now lets hope for a few sales, even if just on those I've reduced in price!! This is Indeg, the cat who owns my daughter and family..named after one of their friends. Writing about myself for a gallery I hope will consider my work. "I am an artist,mainly in clay, and ink on paper. I have been doing this for over fifty years. At present I am concentrating on lino-printing, having not had a clay studio since 2012 when I moved to Scotland from Wales. 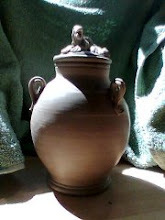 I hope to return to clay again soon "
Its a beginning. Should I mention Art college? The dreaded "artist's statement" will take a little longer, but must be faced! Four years after the library there (and much final show work) went up in flames, fire has returned to the Glasgow School of Art, just a year before it was to re-open. It sounds worse this time, with water being pumped from the river Clyde to get enough pressure, and spreading to the old ABC cinema next door. You feel unbelievably sad, for the artists and students' work there, for the builders and craftsmens' work in re-building and restoration. Pirate got painting...refreshing our garden seat..
Luckily that dried before the rain returned! I think thinner paper is needed for finer lines..some of the detail between the tree branches has missed. Day Out. for a change!